B Co. 5th Batt., 60th Inf (Mech) 9th Inf. Div. 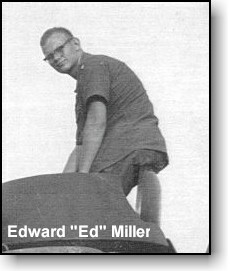 Ed Miller, of K Troop, resides in Lockport, NY. He served in K Troop's 1st Platoon. PFC Miller survived the ambush of May 21, 1967 in which 16 K Trooper's were killed. He was awarded the purple heart for his wounds sustained during this action. Ed has submitted the following photos. K-13 Busting through area - 4-28-1967. ACAV K-13. Photo by Philip Watt, Motor Pool Sgt. after ambush. Ed Miller on top of B-22 B Company, 5th Batt., 60th Inf. 9th Inf. Div. 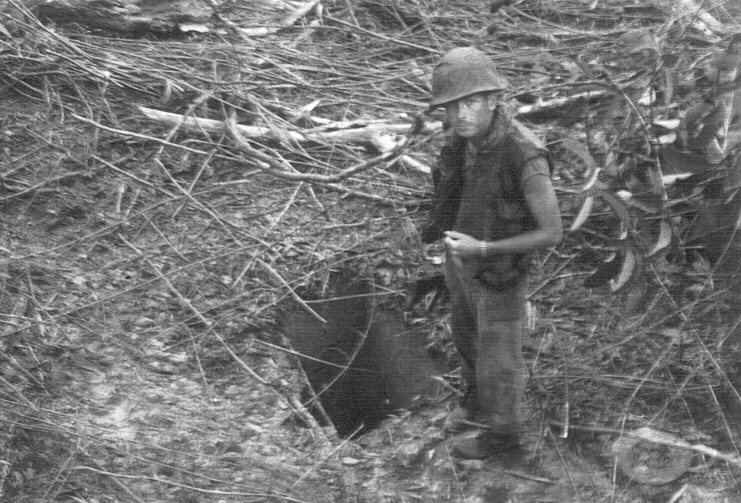 James T. Stieghner, Ed's Track Commander (TC) punji pit inspection. Edward Miller's account of the ambush of May 21, 1967. On that Sunday morning everything seemed normal as we went along the road toward the rock quarry. Just before the first round was fired, I noticed that the road traffic just stopped and that they all went to the ditches on the sides of the road. Just as I was commenting about this to Jim, my TC, we heard the call of ambush, ambush, ambush come over the radio from SSG Pittman. 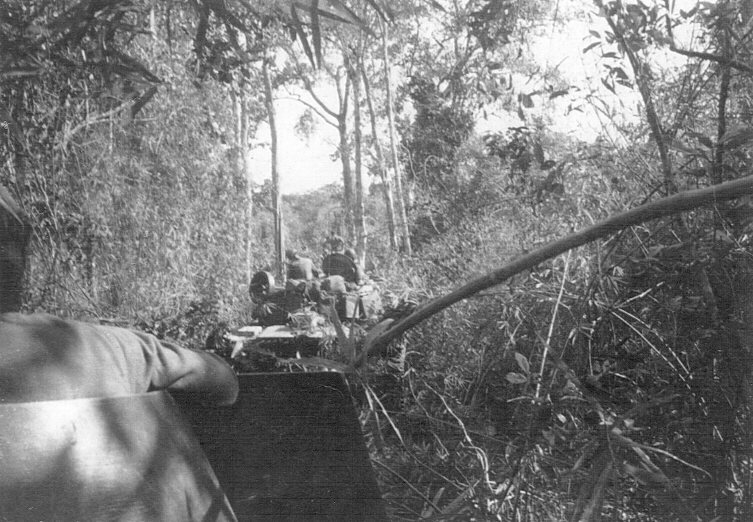 Heavy small arms fire became intense and we turned left off the road and into the direction of the ambush. 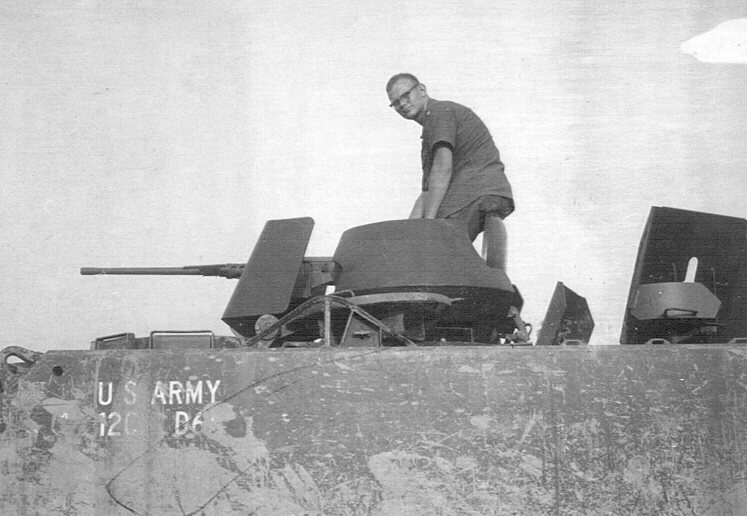 After moving about 50 yards or so, our ACAV was jolted by a recoilless round that struck the driver's compartment and disable the engine. A second round struck the TC turret and knocked out the .50 cal.machine gun with it. A third round this the left side M-60 (machine gun) and carried through hitting my M-60 on the right side. When the first two round struck the ACAV, the impact knocked me down inside the track. I managed to get to my feed and checked on the condition of my crewmates. They were all dead due to massive injuries. 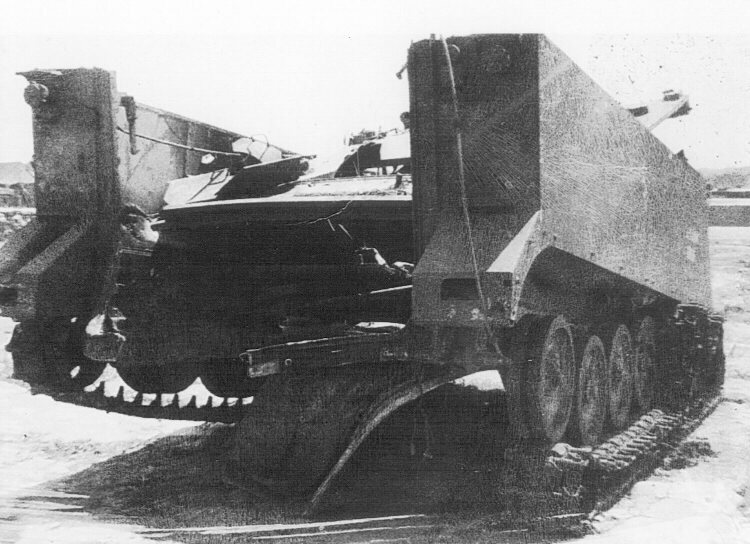 All of our massive firepower was blown apart from the recoilless rounds hitting the ACAV. I managed to piece together a M-16 and fired all the rounds that I could find. After using up all the ammo, I started throwing hand grenades. I had two full cases and about 10 or 15 loose ones. I threw them all, killing or wounding some of the attackers that were moving in my direction. After throwing the last grenade that I had, I saw about three VC move up closer to the rear of the ACAV and throw a grenade towards me The blast knocked me down. I stood back up and they threw a second one at me. That one did knock me out. How much time went by, I don't know. I was starting to come to. My arms were out behind me and I was being dragged away by the VC. Again, some time has passed. The sound of the coppers and tracks could be heard coming along with increased gun bursts. The VC dropped my arms, leaving me there. That is the last thing I remember of the ambush. I was sent to the 24th Evacuation Hospital and then transferred to the 106th General Hospital in Yokohama, Japan. After my wounds closed up, I was sent to Walston Army Hospital at Ft. Dix, NJ until a was discharged. In the after action report it states that my ability to throw was diminished by the shrapnel and burns suffered on my right arm. Although I did suffer those injuries I do throw left-handed and was effective in my efforts. Since the ambush, my mind has blocked out the names of those that I was with in K Troop. I have a photo of my TC. When I sent it home, all that I put on the back of it was Jim, my TC. As quirks happen, while looking at the list of those men who gave up their lives, I hit a key on a name and it gave me information on that man. Due to the process of elimination, I came up with Sp4 James. T. Steighner as the TC on ACAV K-13. I trained stateside with B Company, 5th Battalion, 60th Infantry (Mechanized) 9th Infantry Division and went to Vietnam with them in December of 1966. I was transferred to K Troop late in March of 1967. As a shock to me, in 2003 I was an inpatient at the Batavia, NY VA hospital PTSD unit. While there, I met Phillip D. Watt who was a motor pool Sergeant. His duties were to go out and pick up the wreckage and bring it back to base camp. He came out after the ambush and took a photo of K-13 that I've included here.